Each installation of Web is created freehand, based on the artist's studies of spiders' webs. The spread of the outermost points varies, according to the artist's reach, just as a spider's web would vary in nature. Very fine metallic threads are then carefully woven between the mirrored nodes. Upon approaching the piece, there is a moment where you catch your reflection in the web, and suddenly the depth of the space will seem to change dramatically. The multiple reflective points both suggest a web covered in dew and the fragmented view from the many compound eyes of a spider. 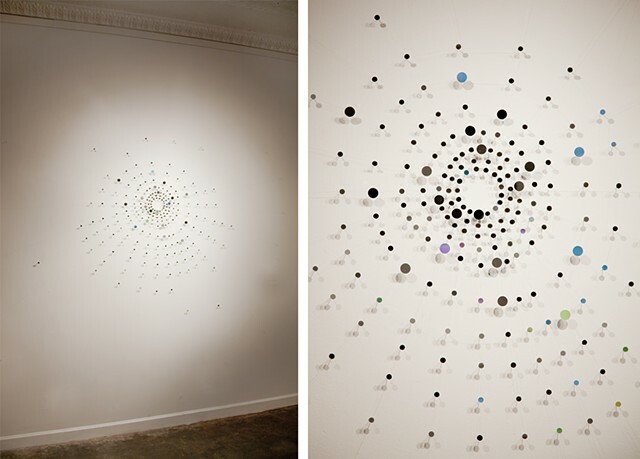 "Geared toward addressing these sorts of ambiguities, Kendler's work is also very clever in its orientation: Each installation of the piece "Web (For There Is an Intimacy Here That Includes You)," more than 200 tiny mirrors connected by metallic thread, is based on studies of how spiders construct their webs and limited in scale to the span of Kendler's arms—unless there is a stool, like a tree branch, at hand. - Sam Worley for the Chicago Reader in "The Natural Selection of Jenny Kendler"